I will no longer be updating my fanfictions on this site. If you would like to continue reading my stories, check me out on fanfiction.net, dokuga.com, adult-fanfiction.org, and my Livejournal. There have been so many times the site was down, putting me far behind in posting updates, and I post too many places anyway. Sorry if this inconveniences anyone. Hi! I'm SunsetMiko, or Christina works too, and I've been writing Inuyasha fanfiction since 2007. I heavily favor Sesshoumaru/Kagome, but I've been known to write Inuyasha/Kagome and a few others as well. My absolute favorite, however, is Sesshoumaru/Kagome/Inuyasha. You just can't find enough good fics for that trio! I love my fandom and I won't allow myself to write for any others since I have more than enough to keep up with in this one! I'm probably best known for 'She Who the Prophecy Foretold' and 'The Syndrome', but between chapter fics, oneshots, drabbles, and drabble collections, I've written/posted more than 100 different fics. I love banners and will go out of my way to write for challenges if the shiny banners are pretty enough. I'll be 30 this year, married for 11 years (David), with a 10 year old girl (Destiny), 3 year old boy (Dante), and 2 year old boy (Damien). I'm also a homeschooler, so my house is never empty or quiet. I do my best to write as much as possible and I've recently fought back the laziness that had overwhelmed me, though I don't know if it really counts as laziness. More like I'd rather sleep than stay up all night and write. With the boys running me ragged, I think it's excusable. I know people are tired of waiting for updates, but life happens and family comes first, so you'll be waiting until I find the time and energy to get to whatever you're waiting for. I ask, as politely as possible, that you not leave nagging and complaining reviews or messages about updates. I really don't need you to tell me just how long it has been since I've posted a new chapter. Trust me, I know. My life, health, and family come first and it really is frustrating/upsetting when people complain about updates without even considering that there might just be a reason for the delay. I'm not a fanfic-writing robot, I'm human, a homeschooling mother with a million other things to do besides write. Please keep this in mind and be patient. I am tired of people trying to guilt me into updating it. I am tired of people complaining that I should be updating something else and not working on whatever I am, as if it is up to them what fic I work on first. I am tired of people getting nasty, threatening not to read my fics anymore because I haven't updated... If you don't like the wait, then read something else. Please remember, I'm not getting paid for writing and nagging doesn't help in the slightest. It just makes me cranky and makes me want to put the laptop away, rather counterproductive if you think about it. I now have a yahoo group for updates and announcements that you can be alerted when a new chapter or new fic goes up. It’s also a place for me to talk to you guys about my stories. 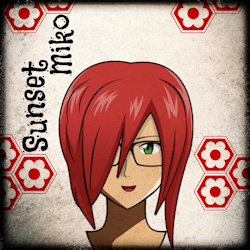 My stories can be found under sunsetmiko at Fanfiction dot net, Adult Fanfiction, InuyashaFanFiction, LiveJournal, Dokuga (and the Spark archive), Eternal Destiny, SakuraRyuu, and Moonlight Flower. On Mediaminer my id is CMK2CMM, though I’ve tried to get it changed… never heard back about it. One last thing... lots of people have been commenting on how short some of my fics are. When it says it was written for a drabble prompt that means that it had a word maximum and so I couldn't make it longer. Some of them might be continued through other drabbles or oneshots and some won't. Please don't complain about length. There's a reason for it! Summary: When sent to get his bandana, Inuyasha returns with something else. Summary: After a celebration in the village, too much sake leads to an interesting experience for all. Set of drabbles, PWP, multiple pairings. Summary: Kagome wakes up and tries to remember what – and who – she did last night. Summary: A drunken Inuyasha welcomes Kagome back. Written for InuErotica's One Too Many Prompt. Summary: Some careful planning allows Kagome to make a fantasy a reality. Drabble written for LJ's IyHedonism. A strange occurrence leads Kagome to see the brothers each a little differently. I do not own Inuyasha and Company, no matter how happy it would make me. Rumiko Takahashi does. Summary: Kagome always wanted it Inuyasha to be her first. Now she just has to convince him. Summary: Kagome discovers that Inuyasha is much better at managing his time than she’d ever thought. Summary: Inuyasha had three long years to think about things. Written for First Tweak's Three Years Later Challenge. Summary: Kagome finally returns after being gone for three years, just to call Sesshoumaru 'brother', despite their past together. Set after the the part in the last chapter of the Manga where Kagome calls Sesshoumaru ‘brother'. Summary: Kanna picks up a new fear and Naraku has to deal with it. Summary: Miroku and Kagome have a secret they're keeping from the group, but some things are hard to hide.